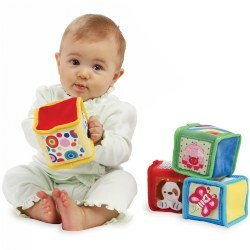 Foam and Vinyl "wooden" blocks provide a softer option for a safe environment. Products come in various sizes, textures, colors, and shapes. 3 years & up. 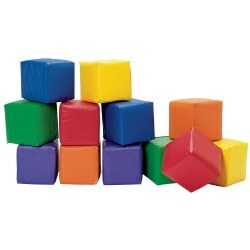 These smooth, colorful, soft foam blocks are ideal for young children. Dense foam 2 inch blocks won't pinch, tear, splinter or absorb moisture. 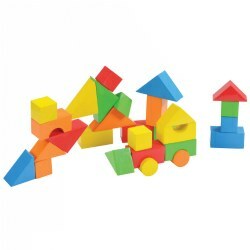 Includes 30 blocks in a variety of shapes plus storage case. Sizes range between 1 1/4" x 1 1/4" to 6 1/2" x 3 3/4". 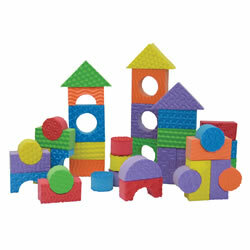 Blocks are soft, light, durable and non-toxic. The precise edges and firm shapes make them easy to build and stack. They are waterproof, float and stick together when wet. 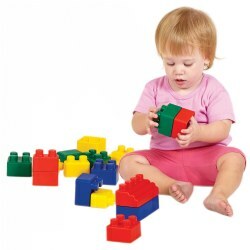 A perfect addition to block or water play. 68 pieces, 9 shapes. 3 years & up. 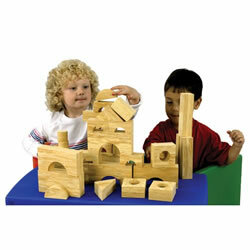 These realistic timbers and crosscuts offer children endless building possibilities. The ten 12" timbers, ten 3 1/2", and ten 6 1/2" crosscuts are made of foam and are perfect for indoor or outdoor use. Activity cards included. 3 years & up. Create a softer environment with the look of wood! 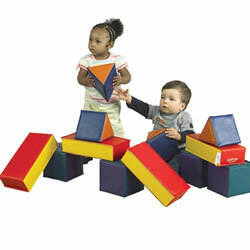 Children of all developmental levels will enjoy creating soft structures with our 80 piece high density foam blocks. 1 1/2 inch thick. Storage tub included. 3 years & up. 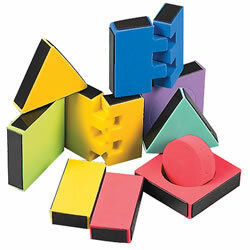 Unique 3 dimensional magnetic construction blocks incorporate colorful shapes for endless creations. Comes in a plastic storage jar. Includes 81 pieces. 3 years & up. 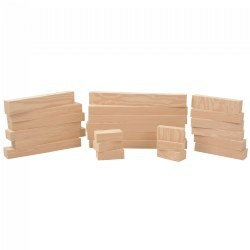 Take a pretend trip to the lumber yard and pick up a variety of foam "wooden" 2 x 3's. Just the right size for that special building project, the 2 x 3's come in four different sizes: 6" x 6", 6" x 12", 6" x 18", and 6" x 24". Six of each size. 6 months & up. 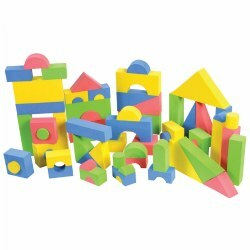 Bendable, twistable, stackable blocks made of soft materials make construction sites safer, encourage creative play, and keep blocks from being damaged if children pull or bend them. 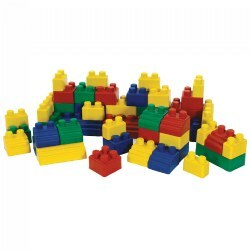 Each set includes a variety of shapes and sizes (all 3 1/2" thick) and comes in an assortment of red, blue, yellow, and green. Available in sets of 16 and 32. 3 years & up. 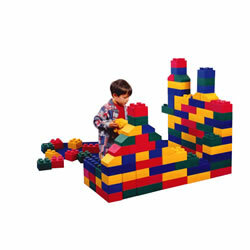 Defy gravity with these silicone coated foam building blocks! They stick to each other but not to hands or clothes. The cling power never fades; just simply wipe off to renew the stick. Includes: 6 squares, 5 rectangles, 6 small triangles, 5 large triangles, 2 cylinders and 4 bridge blocks. 12 months & up. 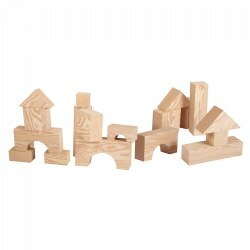 Soft and extremely durable, these bendable, twistable and stackable blocks are ideal for building. An assortment of bright primary colors will appeal to children. Blocks measure from 1 1/2" to 3". 3 years & up. 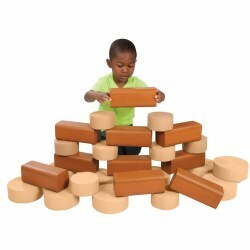 Build to new heights with this fantastic collection of realistic pretend bricks, blocks, and rocks! This set of lightweight, weather-proof foam builders stack easily for endless creative building projects. 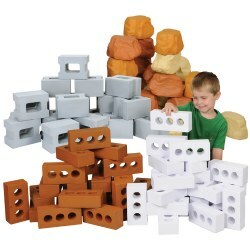 Included: 20-piece Cinder Block Set, 25-piece Rock Wall Builder Set, 25-piece Brick Builder Set, and 25-piece Ice Brick Builder Set. 3 years & up. Add discovery, problem solving, and innovation to water play. 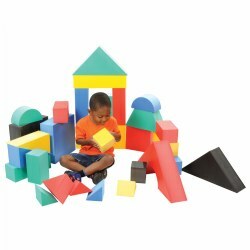 This 15-piece set encourages imagination and exploration while children experiment with different creations. Mildew and bacteria resistant. Mat not included. 12 months & up. 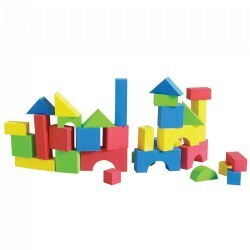 Soft and extremely durable, bendable, twistable and stackable blocks are ideal for building. An assortment of bright primary colors will appeal to children. 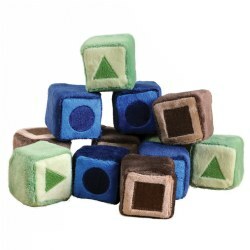 Blocks range in size from 2" long to 4.5" long. 2 years & up. 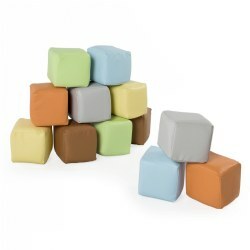 Thirty soft foam blocks with a distinct texture on the front and back. 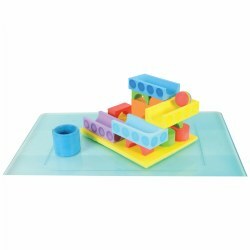 Perfect for toddlers to build and stack while working on fine motor and cognitive skills. Includes 6 different shapes in six colors. Blocks are 1" thick.